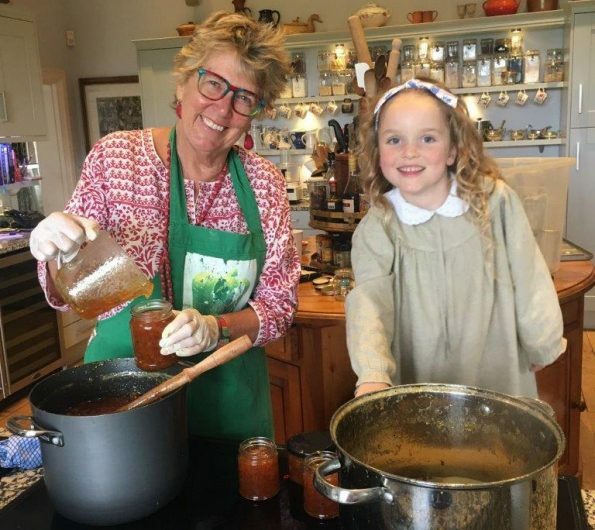 Over the last couple of years I have started to make jam and marmalade with my Grandchildren- which is hot, sticky and messy fun! Remove the pips and tie them up in a piece of muslin or clean J Cloth. Slice the skins of the oranges and lemons, finely or in chunks as required, and add them to the juice with the bag of pips and the water. Leave to soak for 24hours if time. Transfer to a preserving pan or large saucepan and simmer gently until the orange rind is soft and transparent-looking (about 2 hours). Remove the bag of pips and place the bag in a sieve. Using a wooden spoon, press any liquid from the bag back into the marmalade. Tip the sugar and treacle into the orange pulp. Stir well while bringing the mixture slowly to the boil. Once the sugar and treacle have dissolved, boil rapidly until setting point is reached (106°C /222°F). This may take as long as 20 minutes, but usually less. Test after 5 minutes and then again at 3-minute intervals. Allow to cool for 10 mins, then pour into warmed, dry and sterilized jars. Cover with jam covers and leave for 24 hours. Label and store in a cook, dark, airy place. Note: soaking overnight helps soften the fruit. It may be dispensed with, but longer simmering will then be necessary.